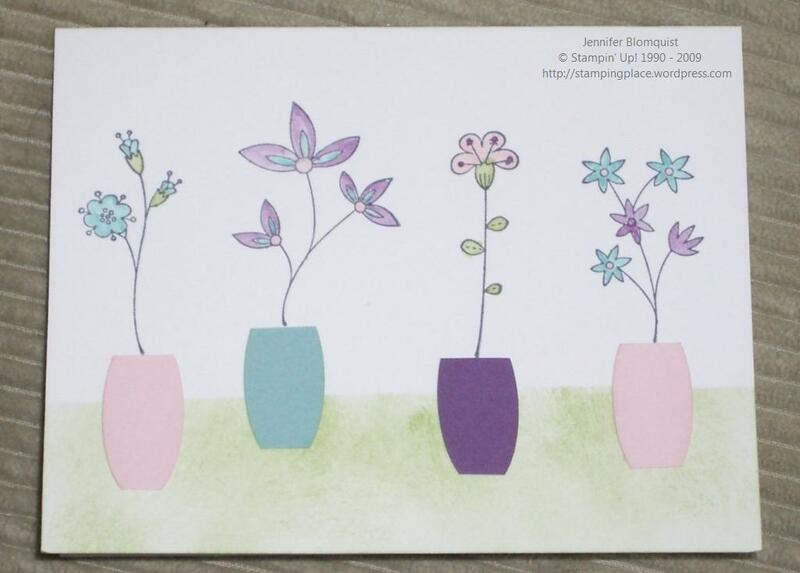 Sponged Vellum Flowers Make Great Cards! I finally got some time this weekend to play for a while in my craft room and it felt great! I was finishing up samples and projects for today’s Creating with Vellum class and once again ended up with way more samples and ideas than I had time to create to share, let alone everyone have time to do in the class. But, I guess that just means some extra videos (and maybe creating with vellum round 2) is in order! But this is the first card I created to show at the class and it got such a popular response on my Facebook page when I shared it yesterday that I decided to make it one of the class projects for today. 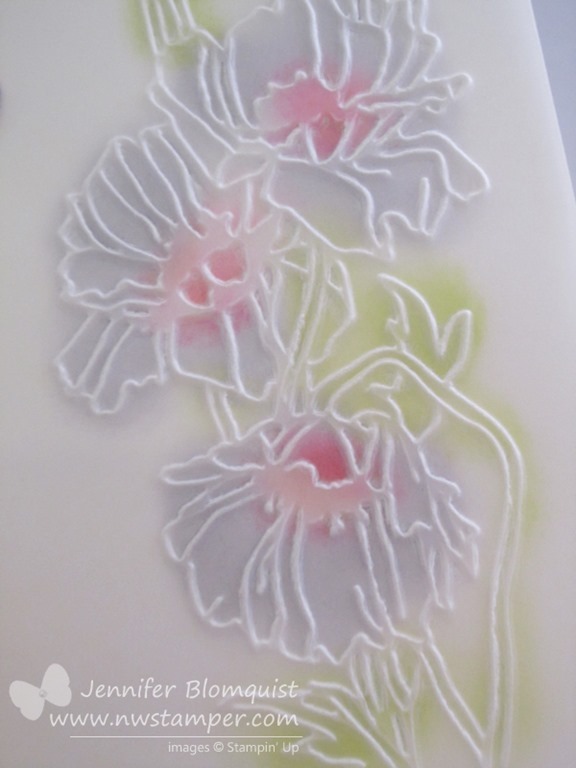 Vellum is a great medium for sponging and getting a beautifully soft look for whatever your project is. In this case, I used the same base piece of vellum and punched out with the Pansy punch three times and then sponged with Daffodil Delight, Rich Razzleberry, and Strawberry Slush. Add a pearl on the middle of each flower to hide the glue dots that I used to adhere the flowers to my card, and they are secure without glue everywhere. Pretty, right? I can’t wait to see how everyone likes it today since it is even nicer in person! And if you are in the Seattle area, I am running this class today at 2pm (at my home) and at 7pm (at Panera in Redmond) and due to some last minute cancellations, I still have some spots – so if you are interested in coming, let me know ASAP and I’ll get you all the details! Email me at jennifer@nwstamper.com. Its been a busy week and I’m suddenly realizing how much I still need to catch up on! I’ve been reorganizing my craft room to make space for all the new catalog goodies that just came in…of course in the process I’ve discovered items that I forgot I had and really need to use more! One of those items is Vellum! 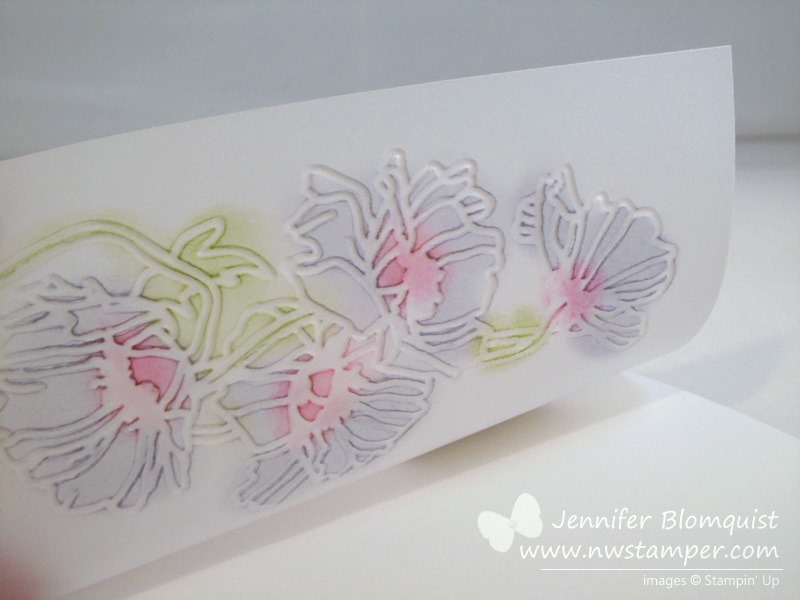 You start out by running a piece of vellum through your Big Shot with an embossing folder (in this case I used the Flower Garden embossing folder). Then on the back side of your vellum, I grabbed my Sponge Daubers and sponged my colors as if to color in the embossed image. The cool thing is that by sponging the back side of your vellum, it gives a pretty, soft glow to the front of your image. And when you think you have made it too dark on the back, it turns out to be just perfect on the front! 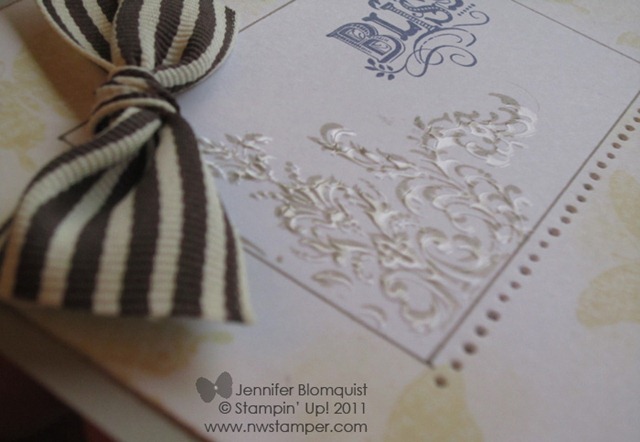 Adhere your vellum to the front of your card by glueing it to the front of a white cardbase and add a strip of patterned paper to the edge for an accent. 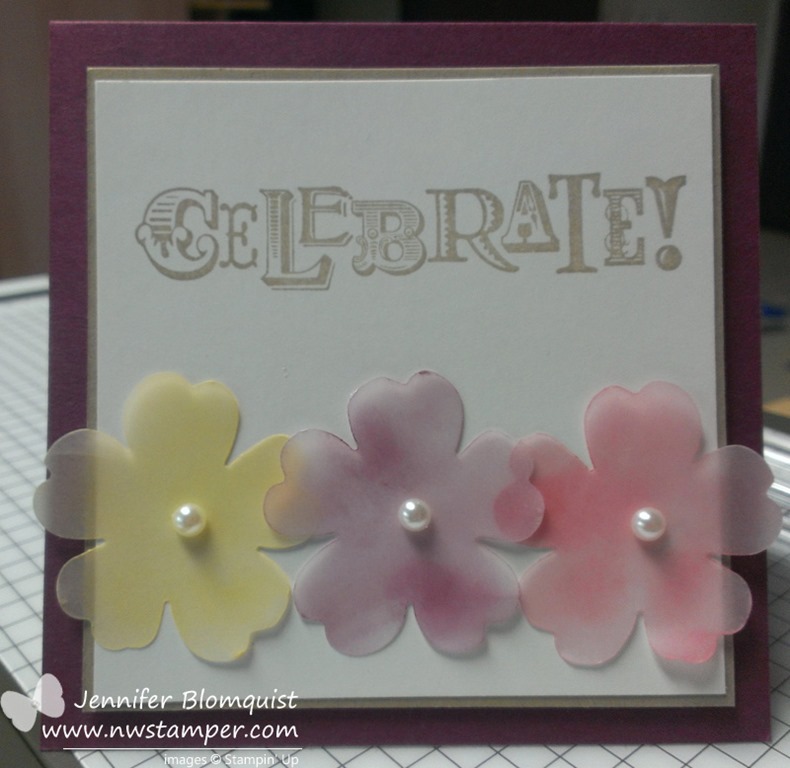 I finished it off by punching out a sentiment from the fabulous Petite Pairs stamp set and sponging it with the same Wisteria Wonder sponge dauber I used for coloring in the back of the flowers. And if you don’t have this stamp set yet, don’t forget it is available for 25% off until June 30th! Check out all the greeting stamp sets that are available in the June 25% off sale! 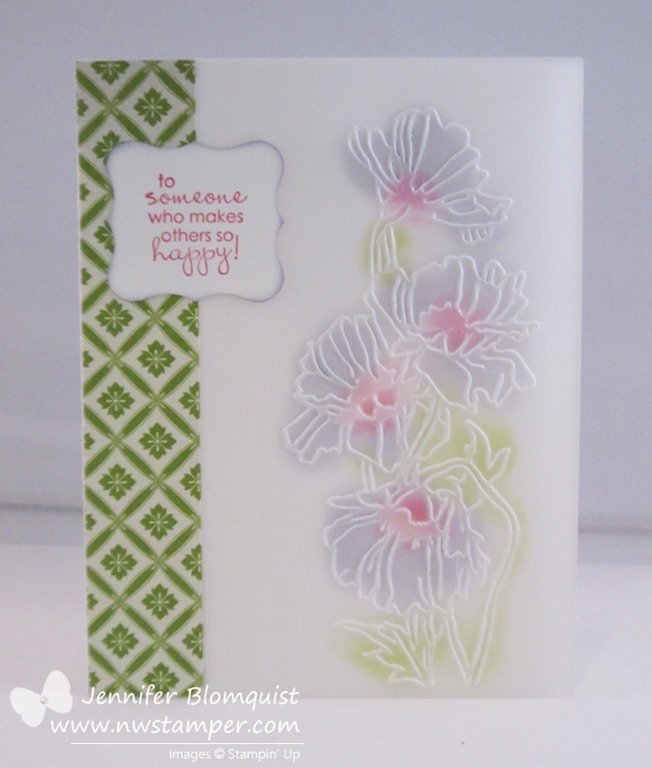 So grab your vellum and embossing folders and experiment with what fun designs you can create. 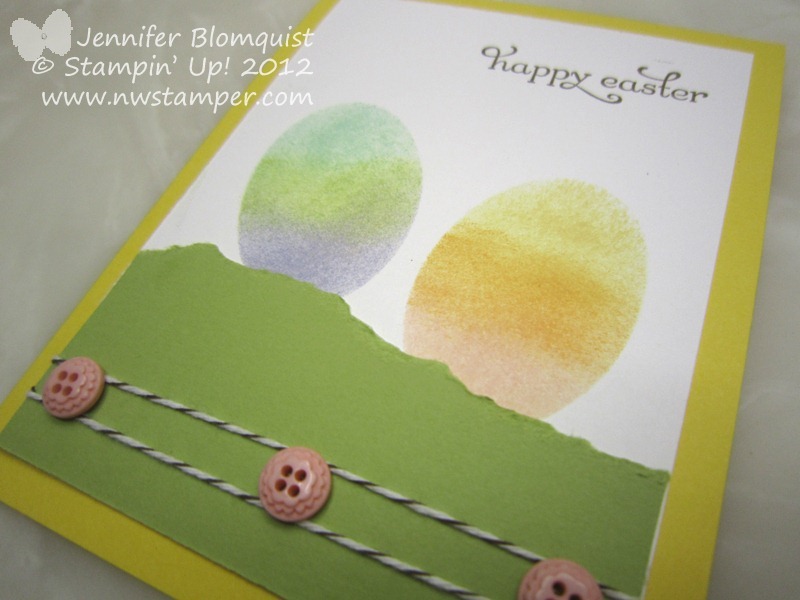 I had this idea to use sponging to create eggs for my card and so I grabbed my handy dandy Extra-Large Oval Punch. Then I punched out an oval on scrap paper and pulled a pile of ink pads and sponges and got to work masking my Easter Eggs. 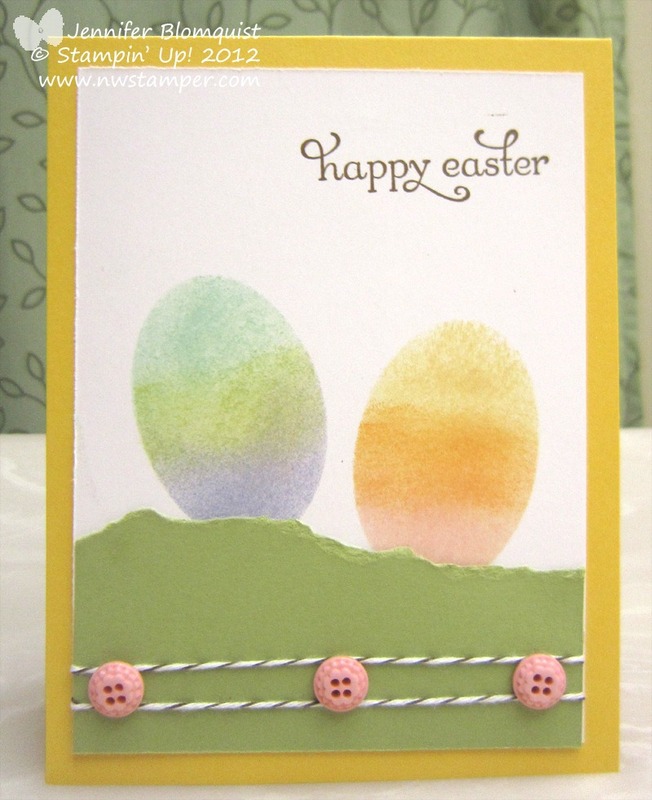 Of course, I made the eggs on a piece of scrap white paper and then had to design the card around the colored eggs. 🙂 But I added some paper for grass and then threw on some Early Espresso baker’s twine and the adorable Twitterpated buttons. So, consider this my Easter card to you. 🙂 Have a great weekend! But, I thought the base idea was good, so I tried again, pulling out some of my favorite elements of the first card and really like how the second card turned out. This is the card we will be making on Saturday and it uses sponging with sponges and with sponge daubers, paper piercing with the mat pack, and then coloring ribbon (its the Organza ribbon that is originally white!) with markers. I can’t wait! 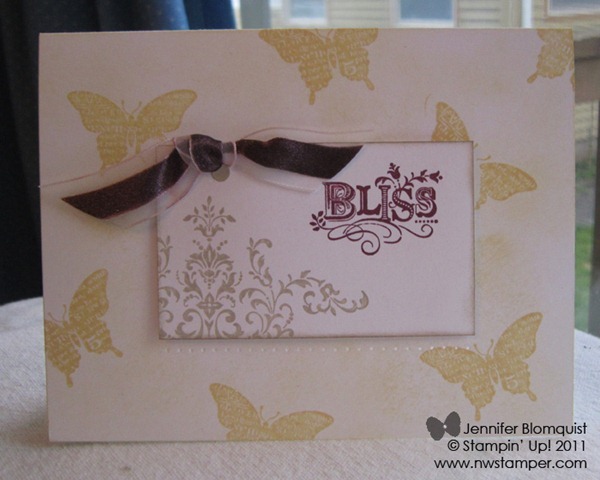 And don’t forget, this is the last few weeks to earn this stamp set – Bliss – free with any $50 order. Stop by the online store and grab some of your favorites and enjoy your Sale-a-Bration freebies! Each week, the Late Night Stampers group has some kind of challenge. This week was particularly intriguing to me as the challenge was to create a single/no layer card. When I first read this, I thought, “won’t these cards be boring?” Well, boy was I wrong! Folks came up with all kinds of cool ways to make a card look interesting without needing lots of layers of paper and embellishments. So, I took up the challenge and decided to create one myself, no paper layers, no embellishment layers, just paper and ink. 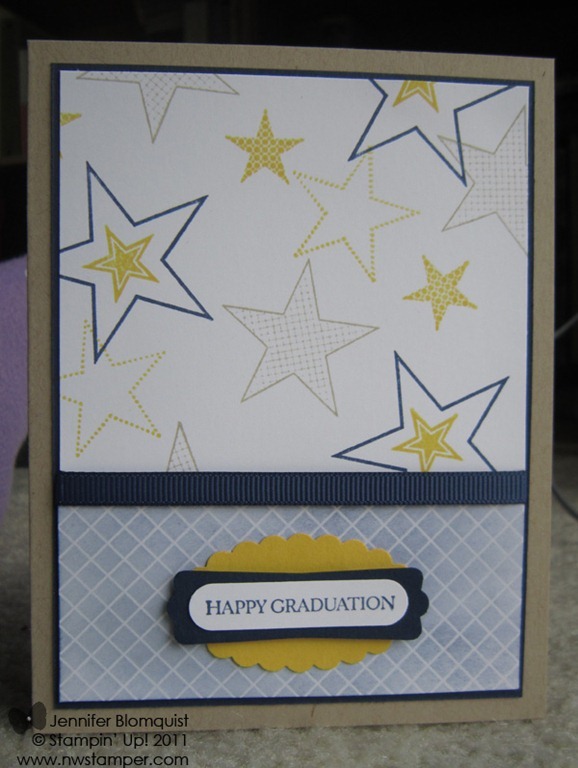 Using scoring lines and sponging, this card turned out much better than I expected. I scored the outer frame at about 1” in from the top and the bottom of the card and about 1/2” in from the sides of the card. Then I scored the inner frame about 1/4” in from the outer frame. 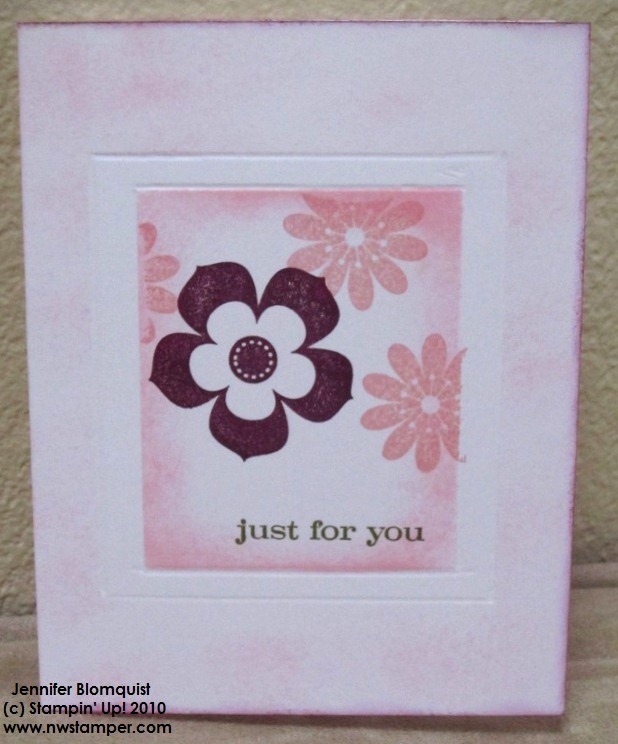 I then masked at the inner frame lines and sponged with Pink Pirouette ink and stamped my flowers using Blushing Bride and Rich Razzleberry. Next I masked the inner part of the score lines so I could sponge the outer areas with Pink Pirouette and finished it off by sponging the edges of the card in Rich Razzleberry. 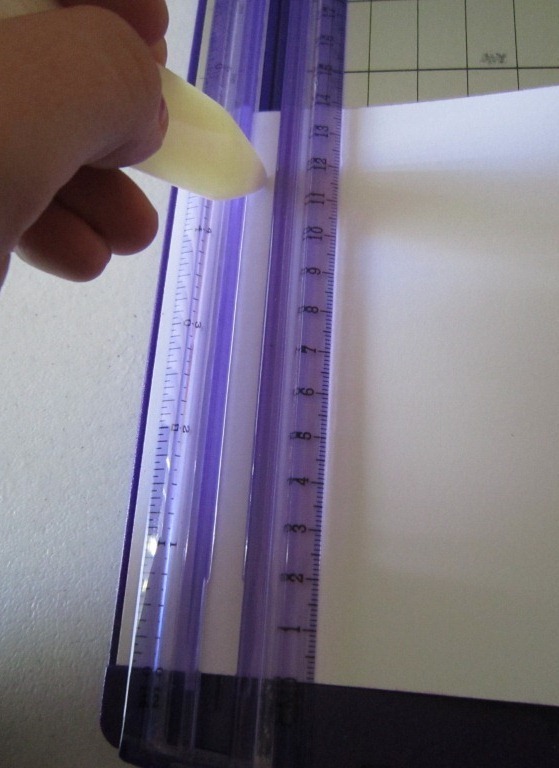 Tip: Did you know that it is easy to score at precise measurements that don’t go to the edge of your paper using a paper cutter and a bone folder? For a frame like I created above, grab a paper cutter that uses a grooved track for cutting like this one and position your paper to the dimension you want to score. So, if you were scoring the sides of the frame above, you would put your paper at 3 3/4” so that you are scoring 1/2” in from the side of your 4 1/4” card front. Then use the bone folder instead of the cutting blade and use the ruler on the cutting track to help you score the length you want – so in this case, from 4 1/2” to 1”. Keep doing that for each side of your frame, and voila! You are done! Need a bone folder or a grooved paper cutter? You can order them here!